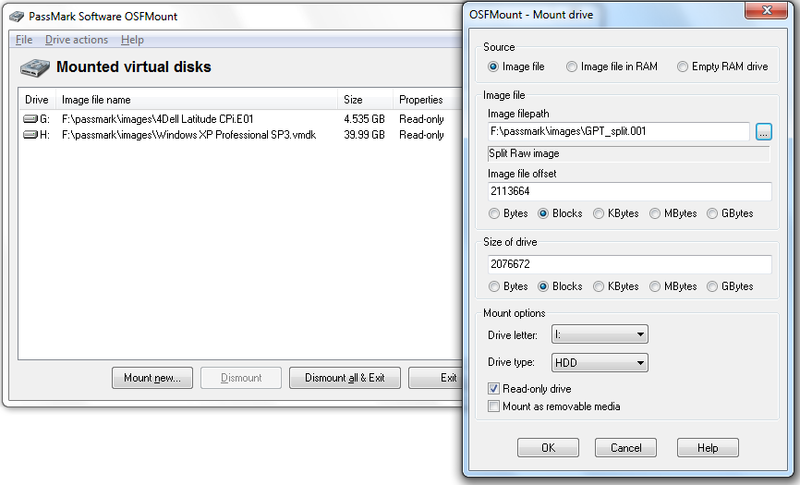 OSFMount also supports the creation of RAM disks, basically a disk mounted into RAM. This generally has a large speed benefit over using a hard disk. As such this is useful with applications requiring high speed disk access, such a database applications, games (such as game cache files) and browsers (cache files). A second benefit is security, as the disk contents are not stored on a physical hard disk (but rather in RAM). ...... This generally has a large speed benefit over using a hard disk. As such this is useful with applications requiring high speed disk access, such a database applications, games (such as game cache files) and browsers (cache files). A second benefit is security, as the disk contents are not stored on a physical hard disk (but rather in RAM) and on system shutdown the disk contents are not persistent. Qweas is providing links to OSFMount Free V1.5.1007 as a courtesy, and makes no representations regarding OSFMount Free or any other applications or any information related thereto. Any questions, complaints or claims regarding this application OSFMount Free V1.5.1007 must be directed to the appropriate software vendor. You may click the publisher link of OSFMount Free on the top of this page to get more details about the vendor.